The 16 blocks in the quilt depict four examples of uniform motion (with paired x-t and v-t graphs) and three examples of accelerated motion – the ultimate project for a science-oriented quilter. Set it up as a puzzle quilt for your classroom. Options are provided to make the puzzle hard or easy, your choice. This quilt can be made with prints, batiks or blocks. 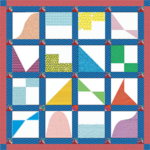 The pattern makes a 50″ x 50″ quilt.